What is now the Church of St. Augustine and St. Martin began as two different missions of the Society of St. John the Evangelist. St. Martin’s Mission had its beginnings in the home of Sarah Jackson at 17 Westminster Street in the South End in 1899. The congregation soon outgrew Mrs. Jackson’s living room and moved first to a storefront on Camden Street and then to a small chapel on Lenox. Street. In the West End, Church of St. Augustine was formally organized. In 1886 a building was purchased on Anderson Street and 1892 a new church was built on Phillips Street. Under the leadership of The Rev. Charles N. Field St. Augustine’s served as a center of community, cultural and religious life for people of color. Saint Augustine’s Trade School was established to teach young men marketable skills. In 1908 the Society of St. John the Evangelist purchased the land next to St. Martin’s Chapel on Lenox Street and began construction of the present building. Later that year St. Augustine’s Church in the West End was closed and many of its furnishing were incorporated into the new building. Father Field was the first pastor of the combined community. On St. Martin’s Day, November 11, 1908 the Church of St. Augustine and St. Martin was formally opened with a ten-day preaching mission led by a black priest, The Rev. John A. Williams, Rector of St. Phillips Church in Omaha, Nebraska. In 1911, pastoral leadership was transferred from Father Field to Rev. Frank Fitz. Father Fitz continued the tradition of community involvement. He worked at developing St. Augustine’s Camp in Foxboro where youth from the congregation and the community had the opportunity for physical, educational and spiritual development. Jobs were scarce for people of color so St. Martin’s Day Nursery was founded to care for children while their parents were working. A relationship continued with the Sisters of St. Margaret. Women’s groups worked to aid St. Monica’s Home with funds as well as to assist the sisters with caring for sick and elderly women in Roxbury. Over the next few years, the church purchased the adjacent buildings renovating them for parish use and for St. James Educational Center, which operated a HeadStart program here. St. Martin’s Chapel was built as an alternate worship space along with “The Well” a gathering space. Currently Church of St. Augustine and St. Martin serves as the home of the B-READY and B-SAFE programs in collaboration with St. Stephen’s Youth Programs. 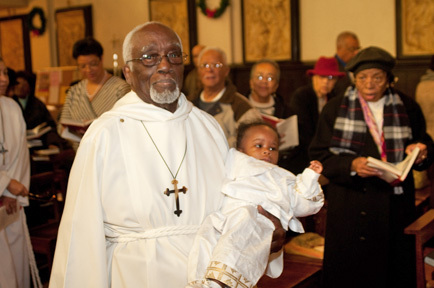 We are one of the founding churches of Roxbury/Dorchester Power in Community and are active in our community and in the diocese. We are committed to the empowerment of all the people who make up the community that surrounds our church.